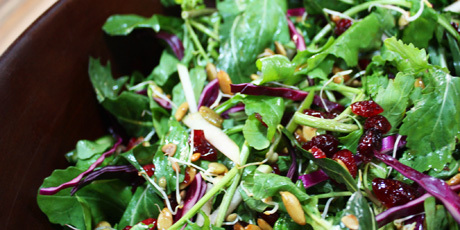 Add some dried cranberries, pumpkin seeds and brown sugar to a bed of arugula, red cabbage and other sprouts. Delciously easy. 1. Preheat your oven to 375ºF. Sprinkle the baguette with water then toss with the olive oil. Scatter on a baking tray and toast in the oven until golden brown, 15 to 20 minutes. The water will add interior chewiness while the oil crisps the outside. 1. Preheat your oven to 350ºF. In a small saucepan, bring the water, salt and sugar to a boil. Add the cinnamon, allspice, clove and seeds and bring to a simmer. Add the seeds and continue simmering and cooking for 10 minutes, then strain. Scatter on a parchment-lined baking tray. Bake until lightly toasted and crunchy, about 10 to 15 minutes. 1. Toss the cranberries with the vinegar and sugar and let them stand for 30 minutes or so. Strain before using. 1. Toss all the salad ingredients together in a large festive bowl. Lightly dress with your favourite dressing. Finish with the croutons, seeds and cranberries. Serve and share. 1. Place all the ingredients in a 500ml mason jar and shake vigorously until smooth emulsified. Alternatively whisk together in a bowl. This dressing is good for months in the fridge – but it’s too tasty to last that long!